To Visit Mount Doom In Real Life You Must Travel Where? Which Novelist Indirectly Contributed To Particle Physics? If you’re a fan of J.R.R. Tolkien’s Middle Earth and want to visit the legendary Mount Doom you’re going to have to do more than pack a suitcase and fill up your gas tank; you’ll need to blast off for Saturn’s largest moon, Titan. 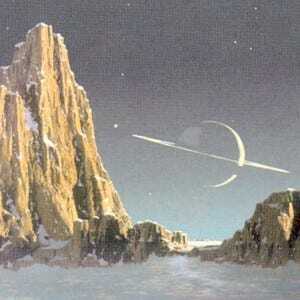 All the mountains of Titan are named after the mountains from Tolkien’s The Hobbit and The Lord of the Rings series. The most prominent mountain on the moon, Doom Mons, is named after Mount Doom and is found in in the Aztlan region of Titan–all the reflective regions of Titan’s surface are named after sacred/enchanted places from mythic stories around the world.